This Villa truly is the Black Pearl of the Orient it is an intimate collection of three 5-star villa's built in a contemporary Thai style. Set in a lush tropical landscape of manicured lawns, exotic. Villa Black Pearl is an intimate collection of three 5-star villas built in a contemporary Thai style. The Villa is rented in its entirety to either families or groups of friends. Villa Black Pearl is set in lush tropical landscaped gardens of manicured lawns, coconut palms, exotic Asian flora, ornamental bridges and man made waterfalls on 23 rai of land overlooking a crescent shaped lagoon, the two-storey villas with a combined total of 9 bedrooms and spacious interiors provide unsurpassed comfort, while the tasteful furnishings and décor create a timeless elegance in a palatial retreat that you will never want to leave. This beautiful mini-resort is situated on the outskirts of southern Pattaya in Huay Yai, which is a scenic and private place just a 10-minute drive from Jomtien Beach and a further 5-minutes from shopping centers such as Tesco Lotus, Makcro and Big C. Also within a 10-minute drive, you can visit Pattaya tourist attractions such as the Pattaya Floating Market, Silverlake Vineyard and Alangkarn Theater. 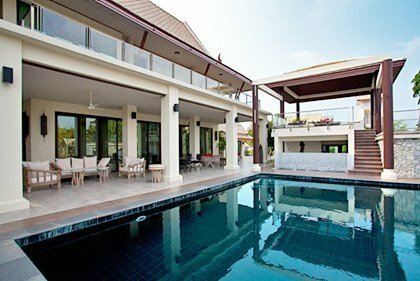 This unique Pattaya rental property is set within its own 23 rai estate with three villas with a combined total of nine rooms. The vast selection of choices and features of Villa Black Pearl is simply astounding. The beauty of the gardens with its maze of walkways, bridges and ponds provides a therapeutic atmosphere for the perfect Pattaya holiday experience. The three villas are positioned in the right hand corner of the estate within close proximity to one another. This is ideal for those traveling together who want a bit of privacy but also want to share lots of quality time together as a group. With such stunning villa interiors that have that real Asiatic feel to them, in conjunction with the spacious gardens and five-star facilities, this has to be one of the best holiday villa rentals in our collection. With such a spacious area to enjoy, the villas are ideally suited to those traveling with families as there is lots of space for the kids to roam free and enjoy themselves. This villa is mainly stated as the Main House, and is situated directly next the infinity edge swimming pool. The villa is set over two storeys where you will find a comfortable lounge decorated in Asian style. There is a three piece settee suite for six persons and lots of entertainment facilities such as a DVD player, surround sound system and a Sony TV with international satellite channels. The unique feature of the bedroom is that it�s split into two bedrooms, one of which has a double bed and the other with two single beds. This downstairs bedroom setup is ideal for a family with children. The wooden flooring's and Asian d�cor really give the bedrooms a classy but warm atmosphere. The entertainment features of both bedrooms are TVs with satellite channels and DVD players. The Master Bedroom also has a large open terrace where you can have a seat and enjoy the views overlooking this picturesque estate. The guest bathroom is on the same floor with a shower, wash basin and toilet. Upstairs, you will find the other three bedrooms with ensuite bathrooms, wooden floors, TVs with satellite channels and double beds. Within two of the bedrooms there are large Balconies, Here you can sit with a drink and watch the world go by. The Villa's are Nestled in beautifully landscaped gardens and with a spectacular view of the crescent shaped lagoon below, this charming 2-storey building in contemporary Thai style features one huge master bedroom and one twin bedroom. With lots of built-in storage space, a living room, a dining area and a fully-equipped kitchen, it is ideal for a young family getaway. It is its own resort has Gym, tennis, and snooker hall.